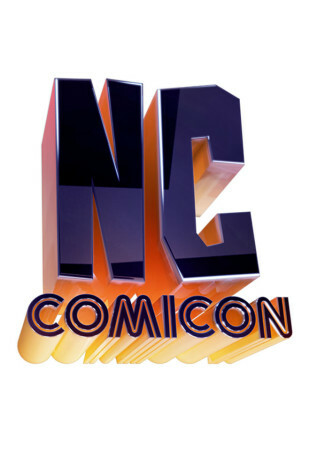 From Friday, November 11th to Sunday, November 13th, Valiant is bringing its action-packed cross-country road show to NC Comicon for a stratospheric weekend packed with award-winning comic books, can’t-miss merchandise, and more! All weekend long, get in on the action with Valiant inside the Durham Convention Center in booth #A601-A602 and see why Valiant is one of the most celebrated superhero universes in comics! Start right here with a complete selection of trade paperbacks, deluxe hardcovers, t-shirts and merchandise for critically acclaimed and award-winning titles including 4001 A.D., BLOODSHOT REBORN, BRITANNIA, DIVINITY, FAITH, NINJAK, THE VALIANT, X-O MANOWAR, and many more! Then, the action continues with a jam-packed slate of signings from some of Valiant’s most acclaimed creators, including New York Times best-selling writer Robert Venditti (X-O MANOWAR, WRATH OF THE ETERNAL WARRIOR) and Eisner Award-winning artist Cary Nord (X-O MANOWAR, Conan)! Plus: Go straight to the source of the largest independent superhero universe in comics on Friday, November 11th at 1:00 p.m. in Carolina Theater Cinema #2 with VALIANT 101: NEW FANS START HERE – a concise and fun-filled introduction to Valiant’s biggest, most iconic, and most memorable characters! You’ve seen the reviews, you’ve heard the buzz… Now find out why Valiant Entertainment has taken fans and critics by storm as the most acclaimed comic book publisher in comics today! Join Valiant CEO & Chief Creative Officer Dinesh Shamdasani and an astounding lineup of panelists for a one-of-a-kind to the Valiant Universe! From X-O MANOWAR and FAITH to BLOODSHOT and DIVINITY, get the stories behind Valiant’s biggest heroes and find out where to jump on board right here with an in-depth tutorial that’s perfect for new fans! Finally, the most exciting panel experience of the weekend awaits with a flurry of updates and insights on Saturday, November 12th at 11:30 am in Carolina Theater Cinema #2 with VALIANT: THE FUTURE OF VALIANT AND BEYOND! With a record-setting 50 Harvey Award nominations, Valiant Entertainment is the most acclaimed publisher anywhere in comics today. Now, find out what’s next for powerhouse series like FAITH, GENERATION ZERO, BRITANNIA, BLOODSHOT U.S.A., HARBINGER RENEGADE, SAVAGE, and DIVINITY III: STALINVERSE right here with Valiant CEO & Chief Creative Officer Dinesh Shamdasani and an all-star cast of panelists! The future of Valiant starts here with an exclusive round of updates – only at NC Comicon! We’ll see you in the Bull City! 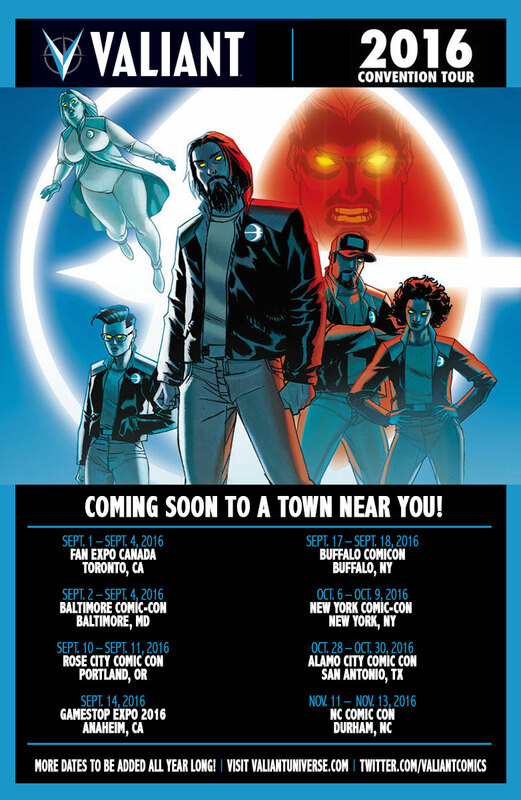 And look for more cities to be added to Valiant’s non-stop convention roadshow in the winter and beyond!